Where to Buy FlyWeb Fly Trap, FlyWeb Fly Light Trap - $31.22 for Sale with Fast Free Shipping! 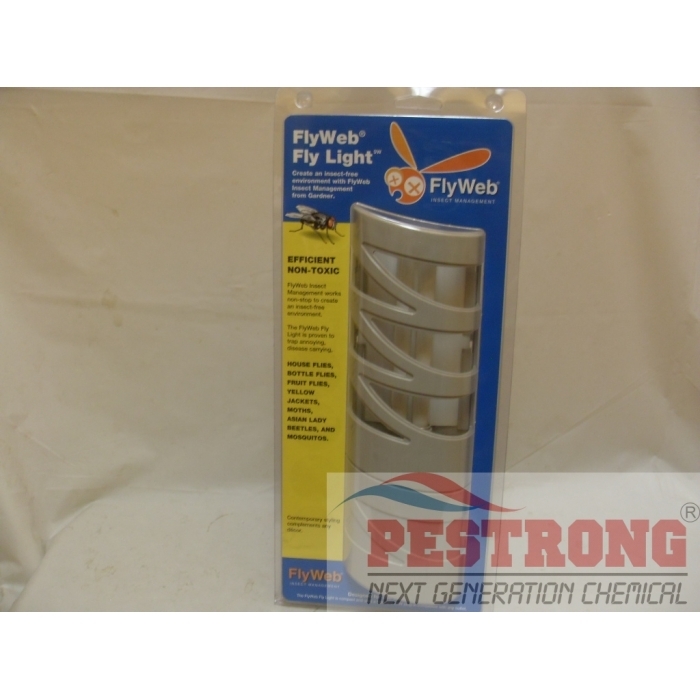 FlyWeb Fly Light Trap uses an insect-attracting lamp to lure insects to the adhesive trapping glue board. FlyWeb Fly Light Trap uses an insect-attracting lamp to lure insects to the adhesive trapping glue board. When the glue board is full of insects, simply remove and discard it. Then replace it with a new adhesive trapping board. The glue boards are non-toxic and safe to handle. The compact FlyWeb insect light is designed for use indoors in residential and commercial areas. Its compact size and direct plug-in features allow the light to be placed in any standard electrical outlet. Remove the protective coating on the adhesive board, insert it into the unit and the trap is set. All you need is an electrical outlet - plug it in. Lures and captures house flies, bottle flies, mosquitoes, fruit flies, yellow jackets, lady bug beetles, bees, moths, and other flying insects. This is the best fly trap I've ever used! I don't like using bait traps because usually the baits are poisonous. And the glue tape traps look gross as more and more flies get trapped, taking them down is a major pain, and since they have no attractant, it takes a loooong time for it to actually catch a lot of bugs. This light trap attacts flies with light and the glue board behind it is how the flies get caught. Because the light is in front of the sticky pad, you don't see the ugliness of dead flies as much. The light is also, just the right amount of brightness too. Not too dim where it catches nothing, and not too bright where its distracting. Once the glue board is full of dead flies, simply take out the pad from the trap, throw it away, and replace it. Simple and easy.